Split-Pea and Coconut Cream Pudding (椰汁馬豆糕) is a very popular dessert in Hong Kong. You might get one small platter of this dessert after finishing your dinner at Chinese restaurants. Well, you hardly have it free of charge at the moment, maybe most restaurants have to cut their budgets back. Many Chinese people like this dessert, especially for little kids. The aroma of coconut milk and soft texture of split peas are very tempting. It could be a perfect party food as well. I use to prepare it one day before. Without any hectic pressure before party, I can enjoy myself. Rinse and drain split peas. Put them in cold water and bring to the boil until soften. Drain well. 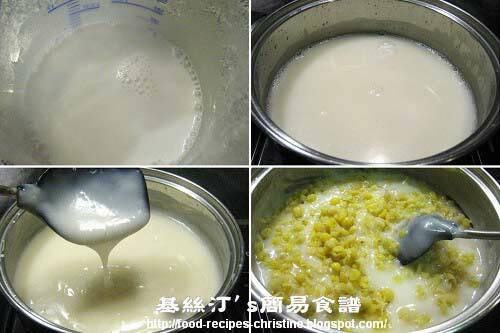 Mix cornflour with 1 cup of water. Make sure to mix them very well. Set aside. Melt sugar with 3 cups of water and bring to the boil. Add evaporated milk and coconut cream. When it boils again, gradually stir in cornflour mixture. Keep stirring and cook over low to medium heat. After the mixture boils again, cook for 2 more minutes. Remove from heat. Add drained split peas and mix well. Pour the split pea mixture into cup cake moulds or a Pyrex bowl. Let it cool down a bit. Then refrigerate for a minimum of 3 hours before serving. After refrigerating, the split pea pudding would become firmer and more tasteful. Be cautious when cooking the spit peas. It easily overflows when it boils. You might like to lift up the lid of your pot a bit to avoid this unpleasant accident. Use the pure cornflour because you want to produce the perfect texture of this dessert. Picture shown below is the one I used, 100% corn. Don't use the wheaten cornflour. Google it and you'd know they are two different things. That's a very interesting combination of ingredients. I noticed when I was in Thailand that many desserts were vegetable or legume-based. I know this dessert is a bit foreign to you. This dessert is quite popular in Hong Kong, a kind of traditional one though. This is one of my all time favourite desserts. Absolutely delicious. Hopefully I shall make this for the first time tomorrow. I'm thinking of tweaking the recipe for a vegan friend of mine who has difficulty finding tasty vegan desserts. Do you think the evaporated milk could be substituted with soya milk? I have heard that the milk component is more for colour than anything else, and am hoping substituting it won't change the flavour too much. Keep up the good work, your recipes look great. Sure, you can substitute evaporated milk with soya milk. That'd be more appealing to your friend, and could be more tasteful with rich flavours. I still haven't, actually - there's an unexpected cornflour shortage in the house! That's good news! Thanks so much for your reply, Christine. No problem. Hope you'll enjoy this dessert when you have cornflour. I have a quick question. Is cornflour and cornstarch the same? Yeah, cornflour and cornstarch is the same thing. Thank You!! 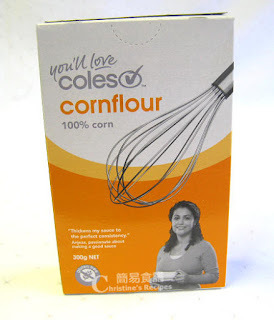 Yah I did some research and some country call cornflour and cornstarch the same thing....I only know the chinese name "ying sook fun" haha Thx again Christine!! Can I use coconut milk instead of coconut cream? Also how is evaporated milk different to condensed milk? Can I substitute it with condensed milk? I think you can replace coconut milk with coconut cream. They're more or less same in nature. But evaporated milk is so different from condensed milk. They're not changeable. Can I steam the split pea instead of boil them? If you steam the split pea, it'd take longer time. I love your site. I'm Chinese American and can't read Chinese, so it puts in a bind when I want to recreate food that I know and love. I've made this but it was a little soft in texture and did not have the "snap" aka soung that I was looking for. Any suggestions, would a wheat starch additional help? Made this for my church morning tea today. Everyone loved it! Simple, cheap & very yummy! Everyone loved it! That's great! I made this and after refrigerating it, the texture came out slimey/gooey. I followed the recipe exactly. Please advise. Was it too much cornstarch? I've used this recipe many times for many years already. I found the quality of cornflour is the key issue to make the texture different. Take a look at the packet of cornflour you used. Was it wheaten cornstarch or pure cornflour? It's better not to use wheaten cornflour for this recipe. Use the pure cornflour that would surely produce the right texture, neither too firm nor gooey. 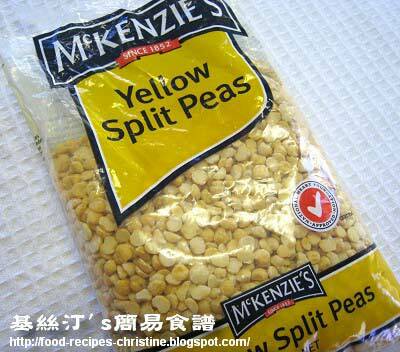 Another thing, make sure to drain the cooked split peas very well. Don’t let excess water spoil your batter. Cook the flour mixture a bit longer time to ensure thickness of batter. i tried your recipe but my boyfriend said its not smooth and too sweet...but what went wrong? Decrease sugar for your boyfriend next time then. If your pudding was not smooth, it could be the problem of starch you used. I tried 2nd time...Its okay now. Phew, i guess i m nervous making 1st time. However i reduce the amount of sugar. Thanks! This recipe worked out perfectly, but I think there was a taste of cornstarch. It may be just me, but would decreasing the amount of the cornstarch/water mixture help? Also, my pudding did not turn out as white. The problems you addressed here could be the quality of cornstarch. If you still tasted any cornstarch, it could be not completed cooked. And your pudding didn't turn out purely white, it's probably because of the colour of cornstarch. I just made the pudding today. but it came out kind of lumpy. i made sure to slowly stir and allow a slow trickle of cornstarch as i kept stirring but it still got lumpy. kind of reminds me of paper mache that we made in grade school. how can i make it smoother? thanks! Cornstarch is quite easily mixed with water, not like other kinds of flours. If the cornstarch mixture (cornstarch+water) is smooth, then after adding it into the boiling sugar & milk mixture, it would easily be combined too. Probably, the stream of your cornstarch mixture is too slow or too small, when some cornstarch was well cooked and became lumps in milk mixture before the rest came in. The pace of adding cornflour mixture is not too slow, not too fast, it should be steady but quick, at the same time, stir the whole mixture with the same speed. Great recipe, I made it twice. I love this dessert as it brings back happy memories for me from when I was a little girl.2nd time came out better because the 1st batch didnt taste much of coconut milk at all(probably because of the sugar and the coconut milk brand) so I tweaked it and let my dad try it, he said it was just like the ones in Hong Kong :) yay! Thank you! So glad that you and your dad liked my recipe. This dessert brings back a lot of my childhood memories in Hong Kong as well. im a huge fan of your recipes! i was wondering if you could substitute corn in place of sweet peas? would this work with corn instead of split peas? Have no idea because I haven't tried with corn. This is my second time making this dessert. First time, I thought I didn't boil the split peas enough so that after refrigerated one night it turned out a little too hard. Second time, I made sure the peas are all soft and some even fallen apart, mixed in with the rest and refrigerated one night, it still is a little too hard....is it supposed to be like this? Split peas will turn a bit harder after chilling. The longer they chill, the harder they become. Thanks for the recipe! To the question above re: corn - I made it with canned sweet corn (because I didn't have split peas) and it turned out great. Hi Christine! Quick question- Is the corn flour you're using closer to Maseca Instant Masa Flour http://www.amazon.com/MASECA-Maseca-Instant-Corn-Masa/dp/B0000IJYK4 or is it closer to Argo Corn Starch http://www.amazon.com/Argo-ARGO-Cornstarch-35oz/dp/B0045DMLXM? Sorry for this ridiculous question, but I just wanted to make sure that I'm using the proper ingredient since ingredient names differ by country! Thanks for all your delicious recipes!! But I haven't tried it with this recipe. You can test it with a small batch.